iLounge's Jeremy Horwitz has filed a new report offering a few new details on the fifth-generation iPad, as well as on Apple's work toward future iPhone models. 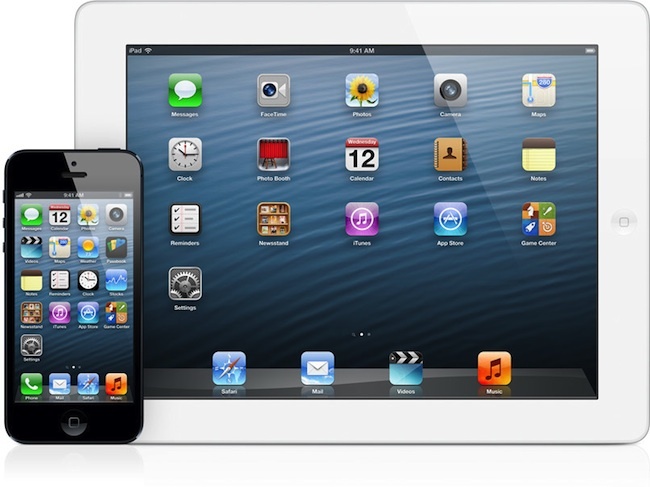 Most notably, Horwitz says that he has inspected what is said to be a shell designed for the fifth-generation iPad, and that the device will adopt many of the features seen in the iPad mini's design. The report notes that the upcoming iPad is so much smaller and thinner than the current design that it seems to require a complete redesign of the interior, likely including a shift in display technology to IGZO panels and smaller chip components. Horwitz says that while Apple had originally hoped to push the fifth-generation iPad out in March, it now appears that an October launch is more likely, perhaps due to issues with component yields. On the topic of the iPhone, Horwitz says that the iPhone 5S will unsurprisingly appear nearly identical to the iPhone 5, although it will have a slightly larger rear flash. The rumored lower-cost iPhone with a plastic shell is indeed said to be in Apple's plans for 2013, with a focus on China Mobile as Apple seeks to lower the cost of entry for the world's largest carrier. Finally, Horwitz says that the rumored "iPhone Math" is indeed in development, but that it will not be appearing this year, if ever. Horwitz has shared fairly accurate information on Apple's product plans several times in the past, suggesting that he does indeed have reliable sources with access to Apple's supply chain. Of course there will be a bigger iPhone. Apple didn't even want a 4 inch screen, but they were pushed by the market. Just put an iPhone 4 next to the current batch of high end Android phones and see how pathetic that screen size holds next to those gorgeous 4.7-4.8 screens. Keeping 3.5 inches would have been a complete joke. So 4 inches they went. Apple even had to saturate the colors on the iPhone 5 screen from previous screens just to show better on the sales floor against the vibrant SuperAmoled Screens. On the sales floor, the vibrant colors of the SuperAmoled just pop and look amazing. Nobody is doing any major photo editing on their puny 3.5-4 inch skinny smartphone screen to require accurate colors. Tim believes they have the perfect screen size at 4 inches. So what about all those past years at 3.5 inches which they professed was the perfect size. What a joke. At least TRY not to be obvious about your trolling. On the topic of the iPhone, Horwitz says that the iPhone 5S will unsurprisingly appear nearly identical to the iPhone 5, although it will have a slightly larger rear flash. I don't believe the smaller bezel rumor. The full size iPad needs places where you can hold it. Well if they make the iPad 5 a lot lighter, I'll be buying it again for the bigger screen. I went to the Mini because it's so light. Trolling aside, I do believe the iPhone 5 and 4 inch screen was without a doubt a reaction to the Android market and the increasingly larger phones. Apple will react again at some point, whether it be 4.5 or 4.7 inch screen, but for me personally it might be too late. I LOVE all of my Apple products, I have a Macbook pro which couldnt be pried away from my hands. The iPad is awesome. I want a bigger phone though, and the only thing keeping me with iPhone for the time being is the ecosystem, however I'm constantly looking into all that would be required to switch platforms and I have to say I am close to the point where a new state of the art Samsung phone in the ~5" range would be seriously appealing to me. I'm close to switching, and can't imagine that I am the only one.